Bridesmaids, bride tribe, besties...no matter what you call your best girls standing next to you on your big day, one thing's for sure - your wedding would not be the same without them! As weddings and all the celebrations surrounding them continue to get bigger and better, the financial and time commitment increases for your bffs. Since these ladies go above and beyond to be there for you every step of the way, why not treat them to something they'll really love as a token of your appreciation? Today we've gathered Bridesmaid Gift Ideas your bffs will truly love! With a 12 karat gold plate finish and pave stones, this bracelet is a sweet declaration of appreciation for your besties. Phrases like "Birds of a Feather" and "Partners in Crime" are inscribed on this pretty bangle to remind your bridesmaids of the sweet bond you share. Give your girls a taste of the luxe life with this curated gift box from Panache Gift Baskets. 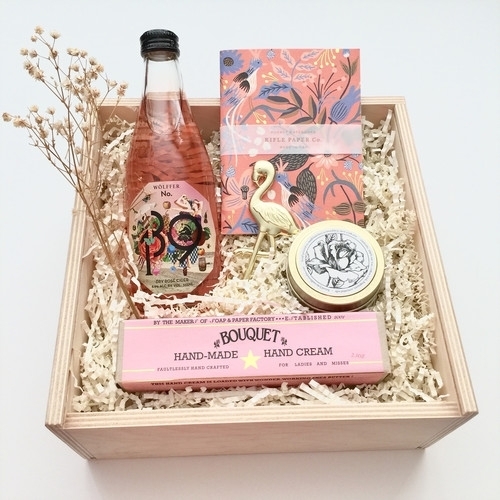 This set includes Bouquet handmade hand ream, two swoon-worthy pocket notebooks, a flamingo bottle opener, an Essie nail polish and a bottle of Dry Rosé Cider by Wolffër Estate (yum!). Be My Bridesmaid Gift Basket, $82. Image via Panache Gift Baskets. Instead of the standard getting-ready robes, give the gift of pajamas instead. These pajama sets from Posy Robes will keep your besties comfy and camera ready! All the showers, bachelorette parties and mimosa brunches can take a toll on a girl's beauty regimen! Keep your girls relaxed and glowing by giving them this Team Bride Glow Set from the leader in non-toxic skincare, Tata Harper. Team Bride Glow Kit, $100. Image via Tata Harper. Keep makeup, jewelry or other necessities close at hand in these personalized bags by The Sleepy Cottage. A minimalist take on the tassel trend, these pretty bags make the perfect catchall for your wedding day essentials! We hope you enjoyed this round up of Bridesmaid Gift ideas. Cheers to you and your bride tribe!